Follow the notification link that Sribulancer has sent to your email address or login to your account to click "Workspace". 2. Click the workspace that has been closed by client to access the platform. 3. Click " Payout Request" that is followed by a " Rating & Review" system for your client. Give the rating based on your experience with 1 being the lowest satisfaction point and 5 being the highest. Write a review or testimony for your client in regards to your working relationship during the workspace. 4. When you're done, click " Review and Request Payout" to begin payout process. 5. Congratulations! You have successfully finished a job and will soon receive your payment. Share the news with your friend by clicking on the available buttons. We use 'EveryDay Payout' system for all freelancers. Freelancer can request for payment any time and will be processed on the same day or next day depending on the cutoff time. 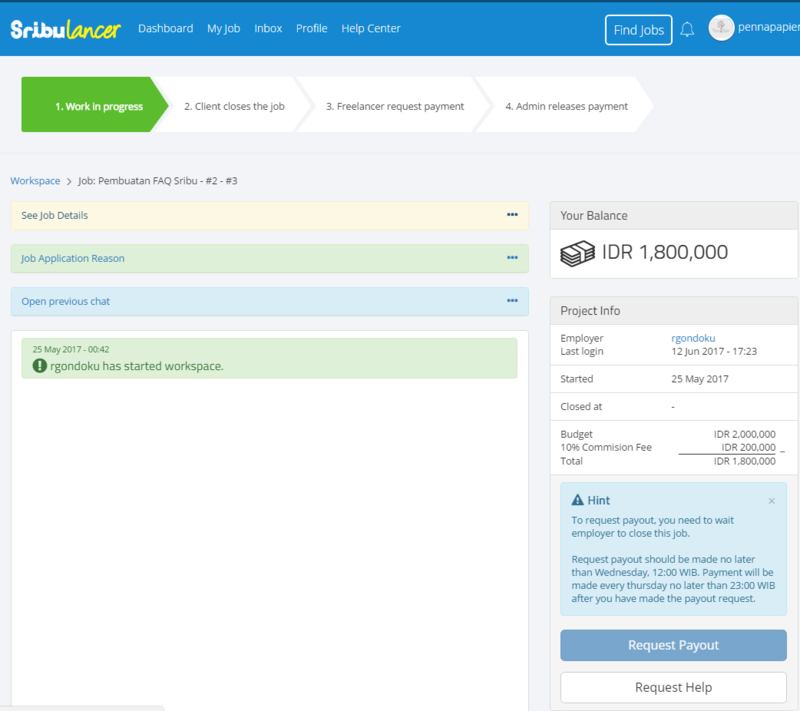 All payments to freelancer will be processed everyday with cutoff time of 11.00 AM noon (WIB). All payout will be processed every weekday (monday - friday). If your request is submitted before 11.00 AM (WIB) on Wednesday, then your payment will be processed on the same day Wednesday. All payments will be transferred to the bank account that is registered to your freelancer account between 0-2 working days. Freelancer A requests payout on Wednesday at 10.00 AM. Freelancer B requests payout on Wednesday at 13.00 PM.